Manager and singer, he plays the guitar and mandolin, has appeared in connection with a Tommy Makem fundraiser and been a warm-up for comedian Jimmy Tingle in addition to performing at such events as Sail Boston 2000, Canajoharie Concert Series, Saratoga National Park, New Bedford Historic Whaling Park and the Boston to England concert series. A tenor with skills on the guitar and banjo, he began his career as a late 1960s folk music entertainer, appearing at local clubs and events. A percussionists (colonial snare drum; Native American and Irish hand drum), he is also an 18th Century historical interpreter, re-enactor and researcher/writer. He managed a Kentucky band "Heavy Metal", performed with "The Regimentals", sang/played tambourine with the international folk group "Nobody’s Children" (1968 West Berlin Folk Festival winners) and is a member of several colonial fife/drum units. This talented band of musicians and singers has a varied, intriguing repertoire of 18th and 19th Century material from period commemorative, tavern/drinking, romantic ballads, sea shanties, children’s ditties, songs of revolt to music of the underground railroad, the Civil War, political views and a spiritual nature. Depending on the programme's purpose and musical selection, The Rogues appear attired in either 18th or 19th Century clothing or a combination of the two periods, adding to the color and charm of the performance. Each musical selection has a prelude explanation of the songs history, folklore and meaning. A myriad of emotions is expected to be experienced by the audience. The Rogues are carving out an unique niche in local musical entertainment. Why not make them a part of your experience? Amongst the titles will be found "Rosin the Beau", "Lizzie Lindsay", "Captain Kidd", "All for Me Grog", "Yankee Doodle", "Star of the County Down", "The Parting Glass", "Rattlin Bog", "Boston Harbor Shanty" plus "Harvest Home", "Mermaid", "Boys of Blue Hill", "Johnny has Gone for A Soldier", "Three Jolly Coachmen", "Maid of Amsterdam", "Greenland Whale Fishery". 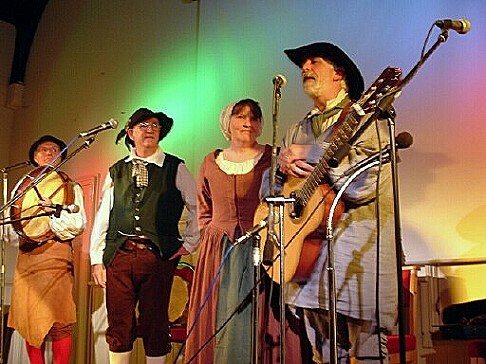 New album - "Captain Billy's Privateers"
The Rogues are members of The Guild of Historic Interpreters, The Guild Music, The Hartwell Players and each has unique talents and brings individual experiences and background to the group.